It seems like some in the Italian defence industry are not happy with the amount of work domestic firms are receiving on the F-35. 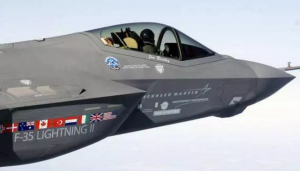 Guido Crosetto, the head of Italian aerospace and defence industry association AIAD, told Defense News reporter Tom Kington that the U.S. “had not honored promises” made since Italy joined the program, hurting Italian firms as well as threatening the livelihood of Italy’s fledgling F-35 maintenance center. Italy is a Level 2 Joint Strike Fighter partner and is committed to invest $1 billion U.S. in the program. The Italian military intends to buy – at this point – 90 F-35s. Italy was told its workshare would likely reach around 65 percent of its investment, Kington reported. “Today we are at less than 20 percent,” said Crosetto who was Italy’s defence ministry undersecretary between 2008 and 2011.